Maximise Your Space with These Kitchen Counter Organization Ideas! 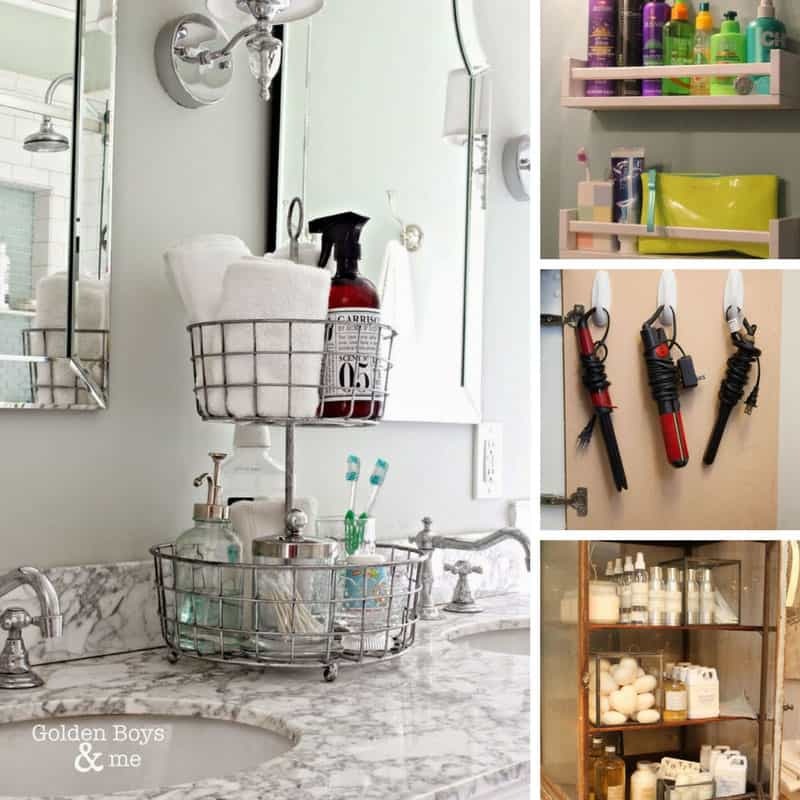 Home > Life Hacks > Maximise Your Space with These Kitchen Counter Organization Ideas! 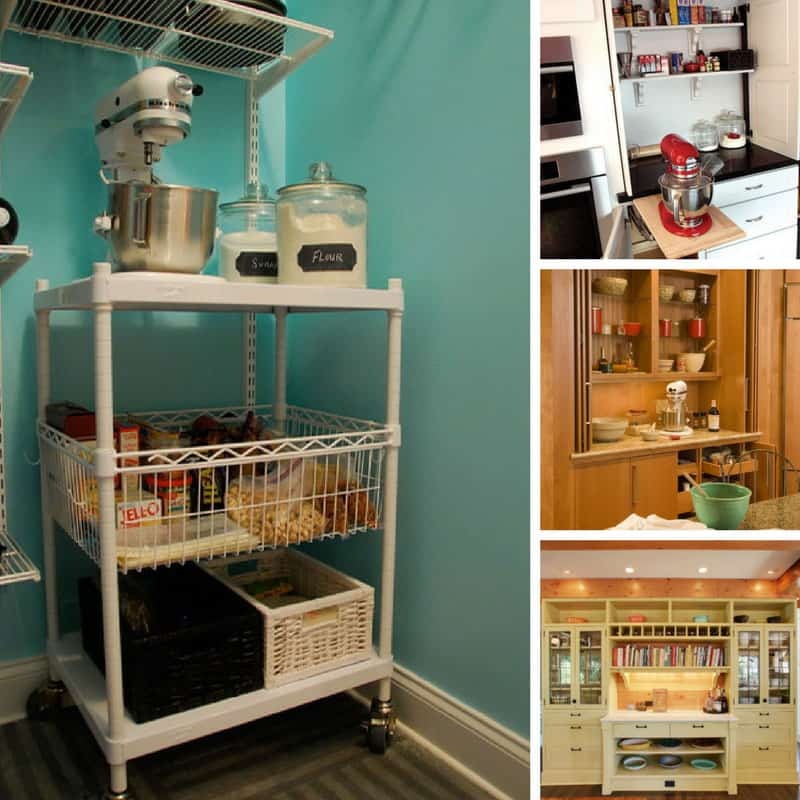 The amount of countertop space you have can really make or break your kitchen. Which is why you need to make sure you get the best use out of every single inch! 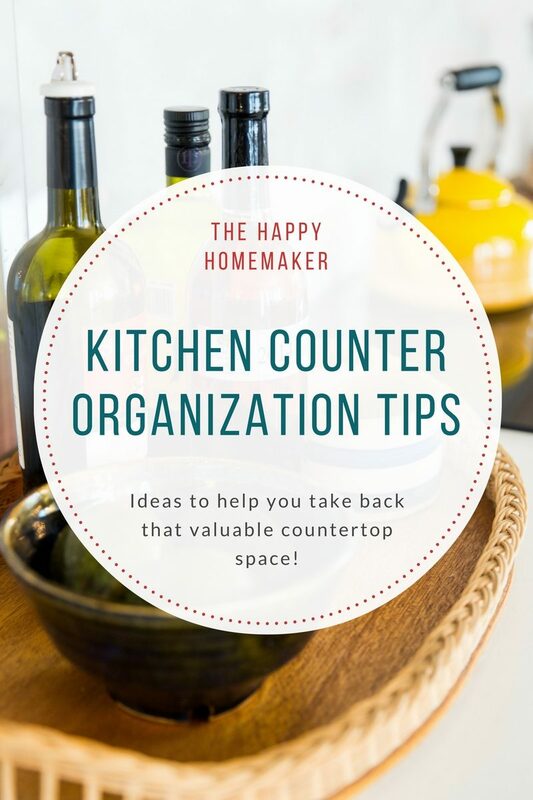 Today we’re sharing are our top kitchen counter organization tips to help you make the most of your countertop space! 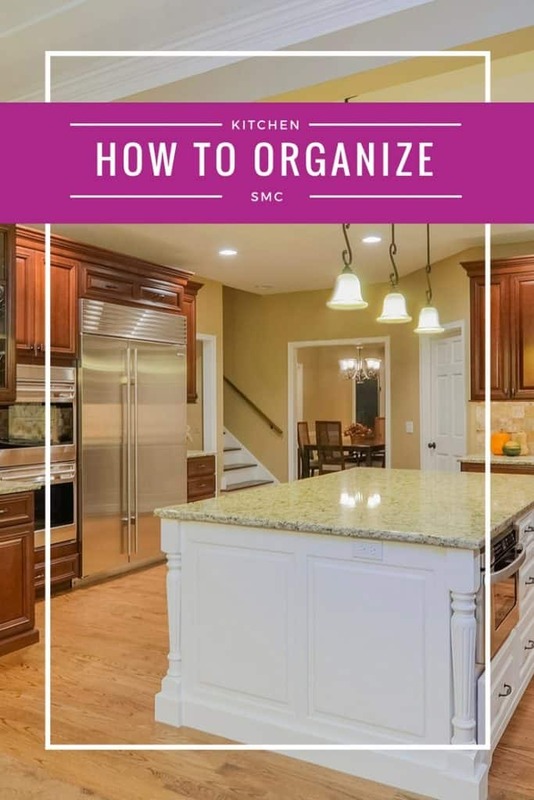 As well as kitchen counter organizers we’ll also look at some under cabinet organization ideas so that you can store things in easy reach but save on countertop space. 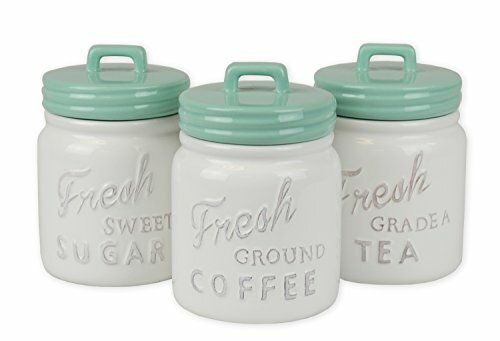 But before you start eyeing up pretty canisters and clever organizing systems there is something important you need to do first… Declutter! If you have done that already then feel free to keep reading, but if you haven’t click here for our tips on decluttering your counters! 7. 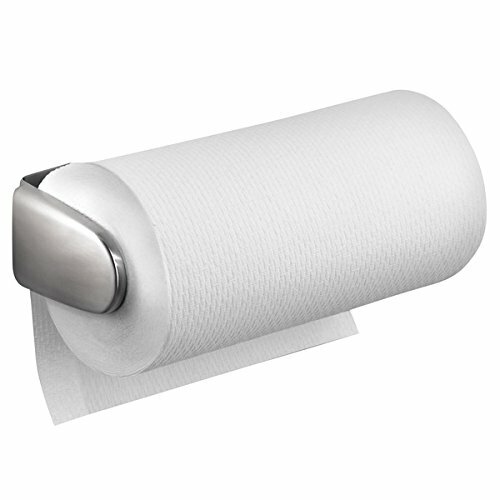 Make moving appliances a breeze with this unassuming piece of plastic! 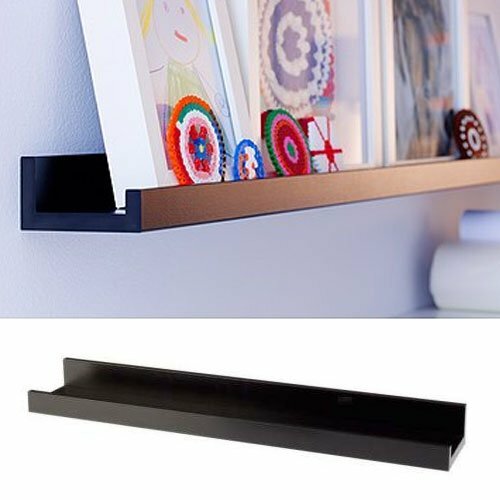 Shelves come in all shapes and sizes and they don’t just need to be attached to walls. Think about adding a series of short shelves to the side of a cabinet that is next to your countertop and use it to store your glasses or mugs that you can’t bear to put inside the cabinet. Or pop your cookbooks on them to keep them off the counter. 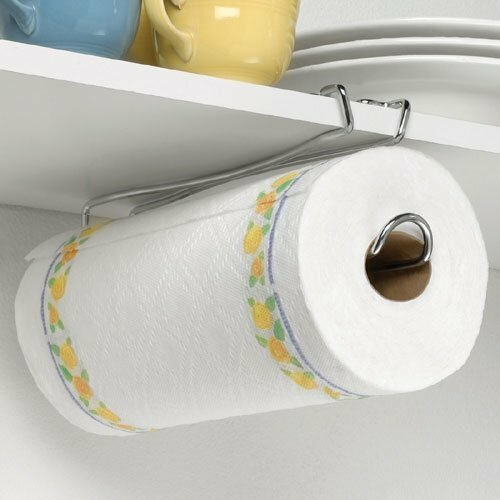 You can attach a kitchen paper holder to the wall, cabinet side or even under the cabinet to lift it up off the counter and make it easier to access. 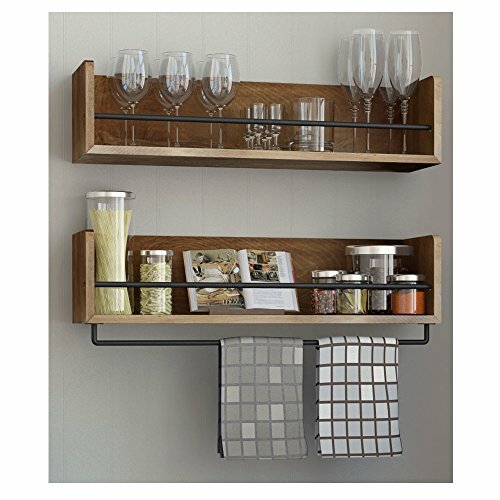 I love the towel holder with a shelf on top that you can install near the sink and use for your dish soap, or put on the side of the cabinet and use as a spice rack. When I thought about the everyday items we used more than once a day FRUIT came out top of the list (I’m lucky my kiddos would rather snack on fruit than candy). 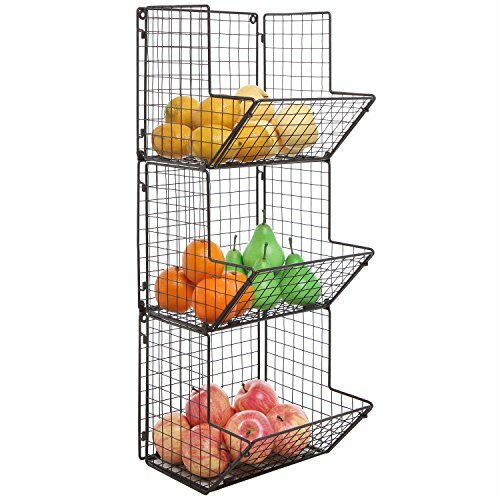 But we don’t really have room on the counter for a fruit bowl so I looked for one that could be wall mounted instead. I even found one you can hang from the ceiling! 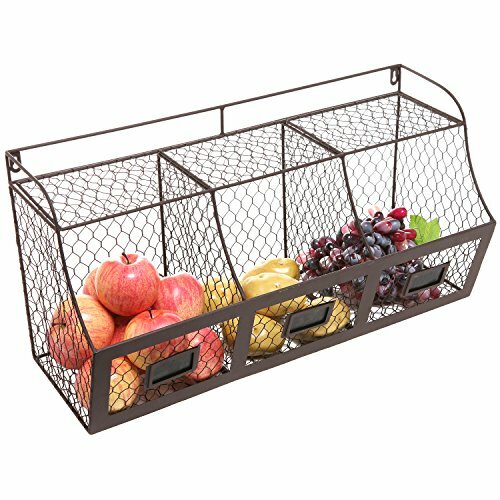 These baskets are PERFECT for creating a snack station. Fill each of the baskets up with healthy snacks in portion sized baggies and let your kids help themselves. 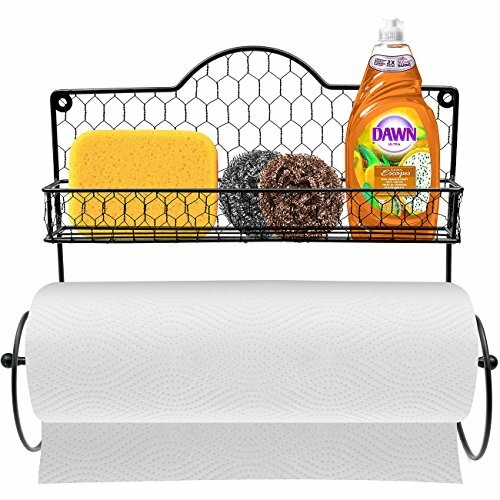 This tiered basket is perfect for a narrow wall or cabinet side If you don’t have an empty stretch of wall hang this from the ceiling! I saw this idea in a magazine a little while ago and thought it was GENIUS! 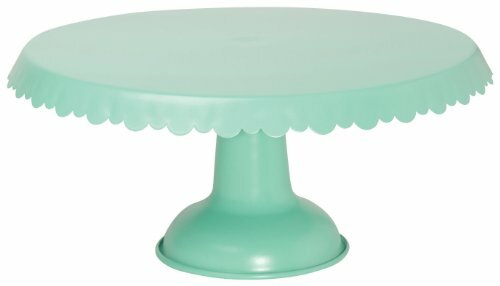 If you really need to keep things out on your counter, use a pretty cake stand to corral them and raise them up off the counter. Use one to keep your oils, vinegar, salt and pepper under control, or pop one next to your sink for your dishcloth and dish soap. It’s easy to move so you can clean under it, and when it gets overcrowded it’s time for a mini declutter! 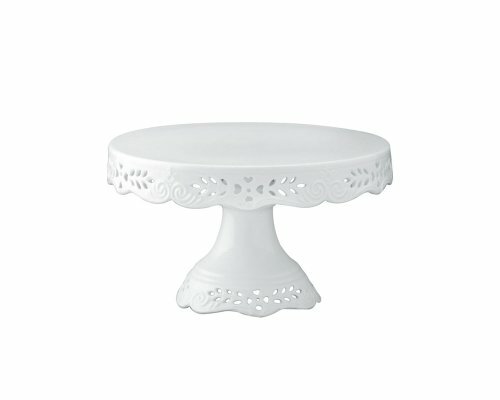 Keep your eyes peeled for a vintage stand when you go to the thrift store to drop off your donation box, or check out these beautiful stands on Amazon. 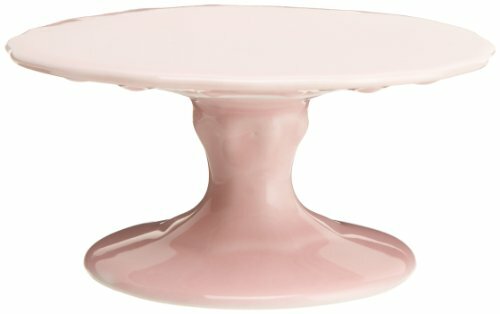 Love this pretty in pink cake stand! 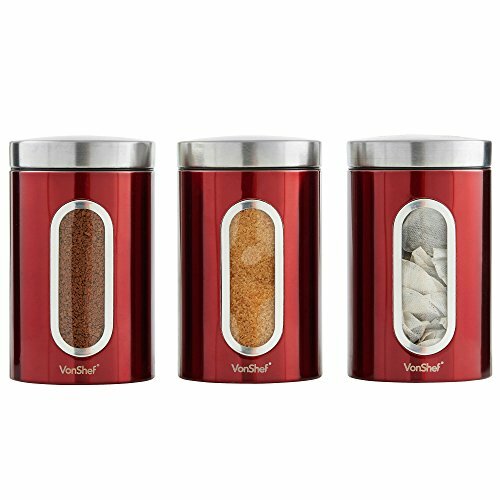 If you drink coffee or tea throughout the day you’re probably going to want to have those items out on the counter. But nothing looks more disorganised than lots of mismatched jars and packets. 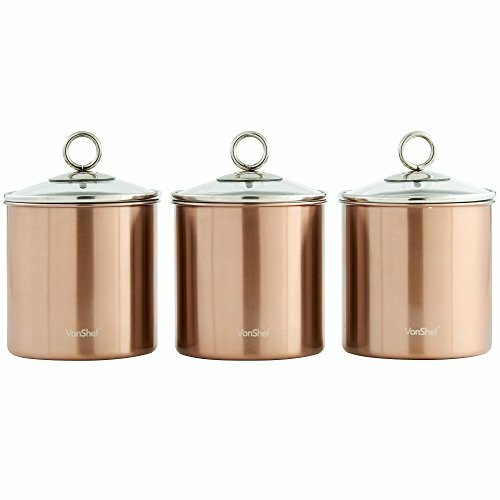 Which is why treating yourself to a set of beautiful, matching canisters is a good idea. 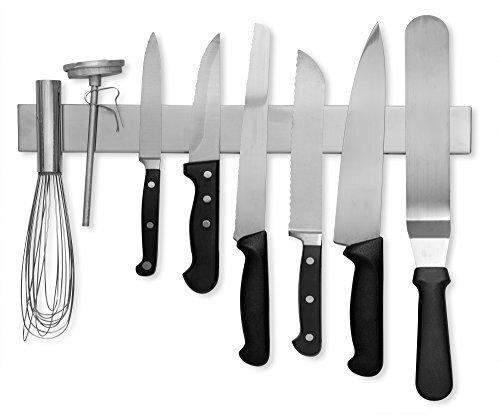 Your set of kitchen knives probably ranks highly on the “everyday use list”, but if you want to leave your knives in easy reach they need to be stored safely, and a knife block takes up valuable countertop space. 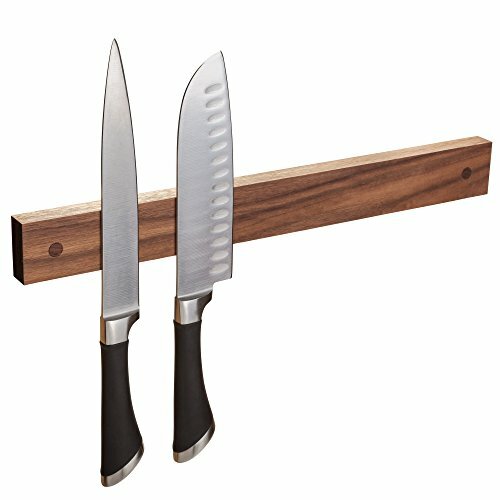 Which is why these magnetic knife holders are a much better option! 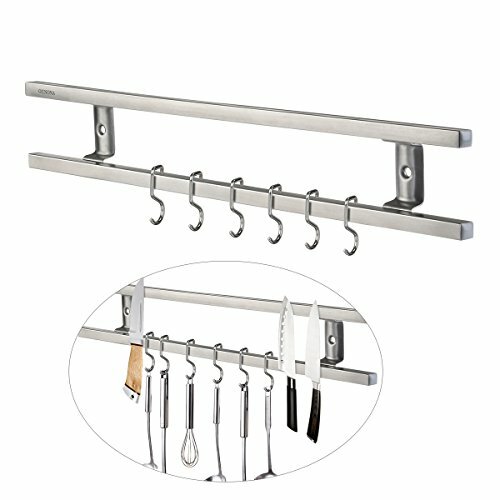 Slide your appliances in and out from under your cabinet with ease! 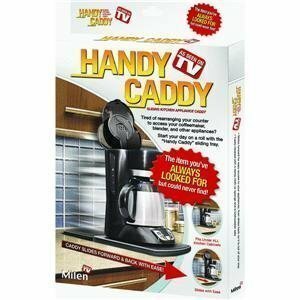 Sometimes when I’m searching for something specific to help organize my kitchen I come across an item I never even knew I needed… like this Handy Caddy! 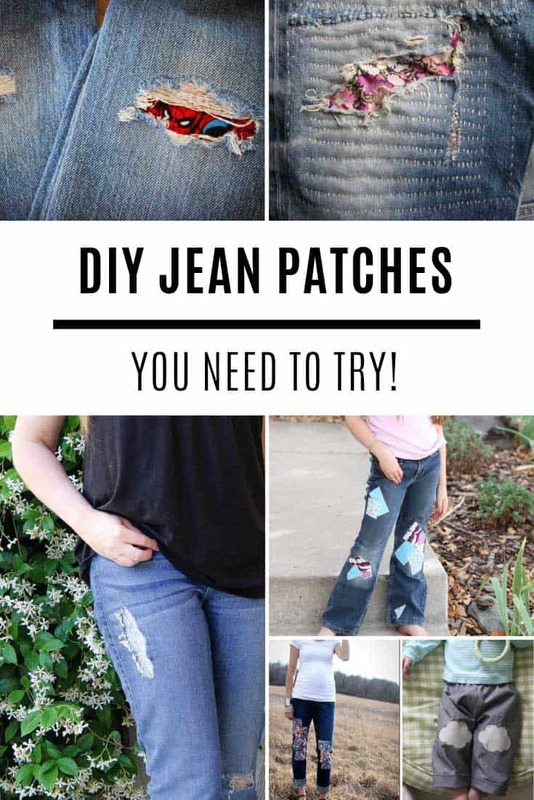 This is such a simple idea (and cheap too!) but GENIUS! If you have a toaster, or a coffee maker or even a stand mixer that you do use daily and needs to live on the counter then this is the perfect way of keeping it tucked out of the way, under the cabinet, at the back of the countertop until you need to use the appliance. You sit it on this plastic sliding thingamajig and then when you want to use it just pull the appliance and it slides to the front of the counter! No more tugging or trying to lift those heavy small appliances, or worst still leaving them out at the front because it’s too difficult to move! Like I say it’s a crazy cheap price too so you’ll be able to buy one for each appliance you need to leave out without breaking the bank! 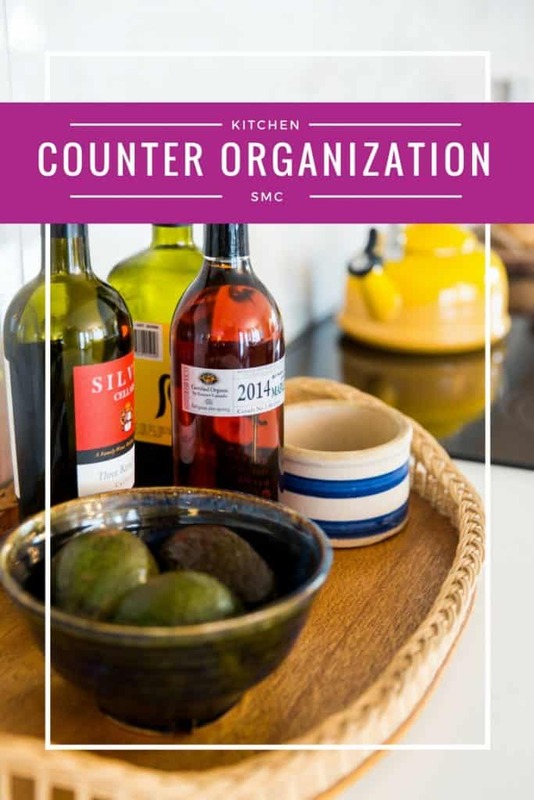 And there you have it, kitchen counter organisation ideas and tips to help you take back that valuable countertop space and make your kitchen look sleek and uncluttered!